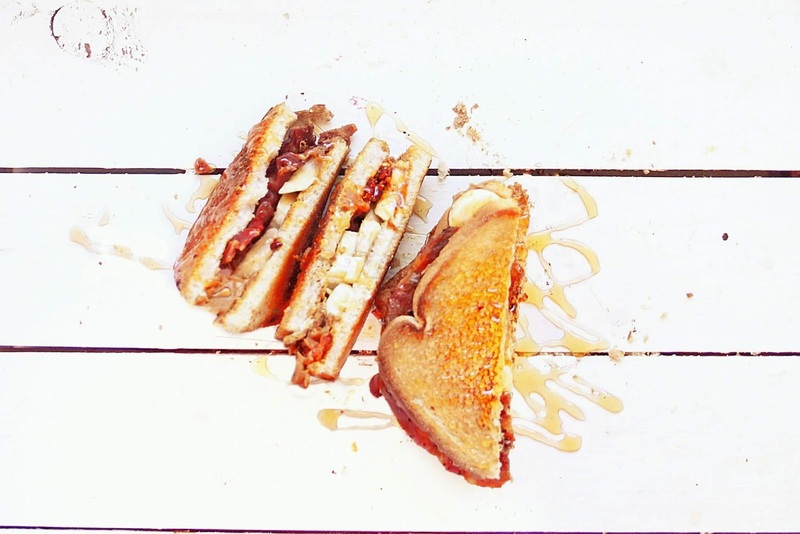 Elvis didn't invent the peanut butter and banana sandwich, but he sure did make it famous. This version includes bacon, and is a family favorite! This sandwich has been a long time in coming. I've posted it on my personal Facebook wall several times. Every time, my friends ask "What is it?" and "How do I make it." So I've decided to share it here. Finally! Peanut butter and banana sandwiches were not invented by Elvis. You see, I'm a Southerner. I grew up eating peanut butter and banana sandwiches. We never even knew Elvis Presley ate them. When Elvis died, an interview with his cook revealed he loved fried peanut butter and banana sandwiches. Most of the country had never heard of this bizarre concoction, but we Southerners were quite familiar with it. I was 9 years old at the time, and didn't understand why everyone thought it was so odd. I'd been eating it my whole life. Of course, as an adult, I realize the uniqueness of our Southern culture, and that many things we do, say, and eat differ from other parts of the country. While I can't tell you how Mr. Presley ate his sandwiches, I can share how we eat ours. When I was a kid, I remember it being made two ways. Neither was toasted or grilled. The first way I remember it being made was to spread peanut butter, and sometimes mayonnaise, on the bread. Then slices of banana were added. The other way was to mash up the banana, peanut butter, and mayo in a bowl, then spread it on the bread. Both ways are good, but my favorite was the mashed up version. Seriously, I'd eat it with a spoon. So good! The version I'm sharing with you today is a bit more than basic. So let's talk about this sandwich I'm calling The Not-Elvis Peanut Butter Sandwich. This recipe is so simple, I hesitate to even call it a recipe. I think it makes a perfectly fine lunch. We don't have it often, maybe a few times a year, and it's so good! 1. Spread the peanut butter on one side of one slice of bread. Top with sliced banana, then slices of bacon. Drizzle with a bit of honey. 2. Cover with the other slice of bread. Spread butter on the outside of the sandwich. 3. Heat a skillet over medium heat. Grill sandwich on each side until golden brown and peanut butter is melted, about 2 minutes on each side. I recommend using a cast iron pan or griddle or this grill pan. When I make these, I cut the banana in half, then slice it lengthwise twice, creating three slices. You can do whatever you want, I just do it this way because it covers the bread with the least amount of effort. 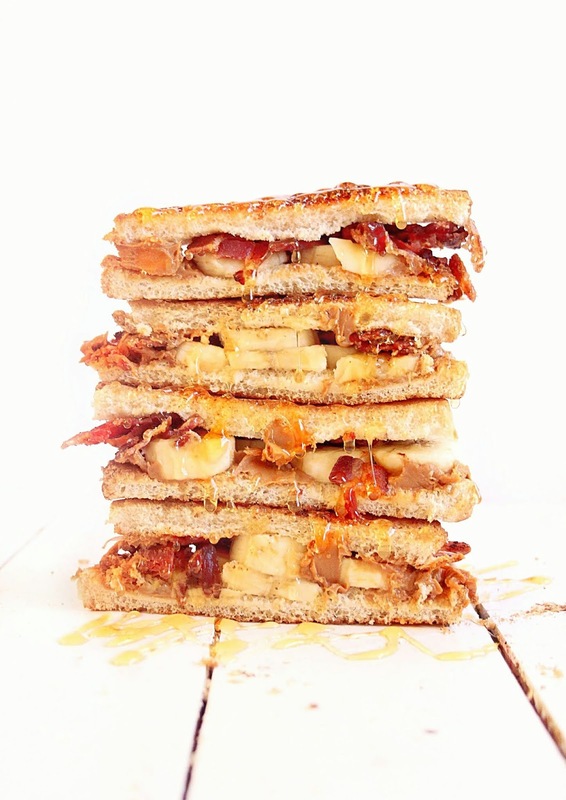 Elvis didn't invent the peanut butter and banana sandwich, but he sure did make it famous. 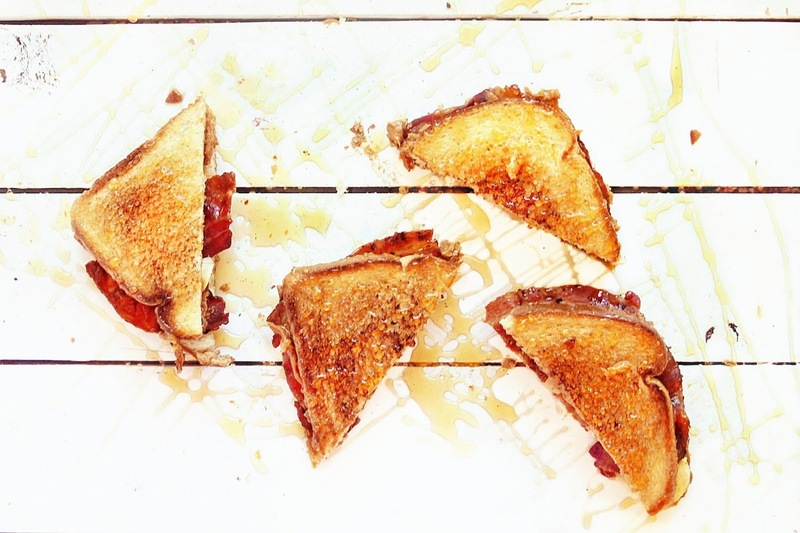 This version includes bacon, and is a family favorite! Perfect for lunch. Spread the peanut butter on one side of one slice of bread. 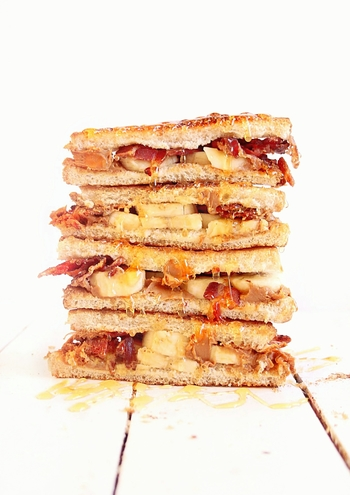 Top with sliced banana, then slices of bacon. Drizzle with a bit of honey. Cover with the other slice of bread. Spread butter on the outside of the sandwich. Heat a skillet over medium heat. 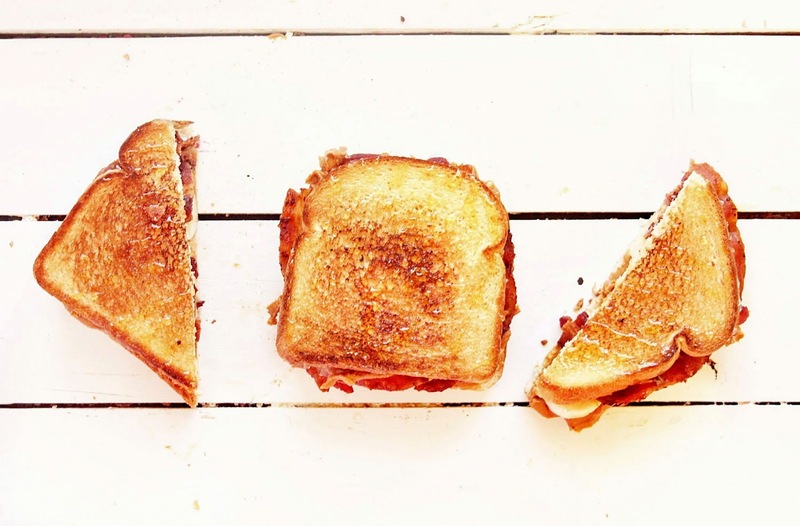 Grill sandwich on each side until golden brown and peanut butter is melted, about 2 minutes on each side.